Give students an interactive, walking pretest (see attachments) to see what they know about the topic prior to the lesson. Cut out hot pepper shapes from construction paper and write the statements directly to the pepper/chili. Students circulate to complete the pretest. Laminate to preserve. Go over responses for correct answers. 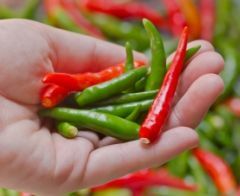 Assign the Hot Chili Pepper Scavenger Hunt for students to learn more about this vegetable, using this website. View The Science of Spiciness by Ted Ed to illustrate how this works in our bodies. Hot Pepper Jelly Lab: For this lab, select 3 different heat levels of peppers; one type for each kitchen. This will allow your students to experience a difference in taste and heat levels for the same recipe. They can decide which is their favorite and adapt the recipe to their liking in the future. Note: Make sure students are wearing gloves when working with the hot peppers and not touching their eyes or skin at any time during the lab!